Scientists say that an advanced member of the biggest dinosaurs ever to walk the earth had a tiny brain, the size of a tennis ball. 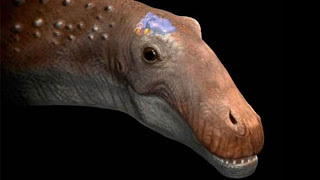 The scientists studied the skull of fossils of the dinosaur Ampelosaurus, which was discovered in the Spanish city of Cuenca in 2007 during the course of the construction of a rail track. The reptile was a kind of sauropod named titanosaur, with a long neck and a long tail. The herbivores were found to be the biggest animals ever on the earth. The scientists scanned the interior of the skull via CT imaging, finding out that the creature's brain could not have been much bigger than a tennis ball. "This saurian may have reached 15 meters (49 feet) in length; nonetheless its brain was not in excess of 8 centimeters (3 inches)," said Fabien Knoll, a paleontologist at Spain's National Museum of Natural Sciences. "We don't see much expansion of brain size in this group of animals as they go through time, unlike a lot of mammalian and bird groups, where you see increases in brain size over time," said Lawrence Witmer, a paleontologist at Ohio University. The scientists have wondered for years how the biggest animals ever lived with small brains. "Maybe we should flip that question on their end - maybe we shouldn't ask how they could function with tiny brains, but what are many modern animals doing with such ridiculously large brains. Cows may be triple-Einsteins compared to most dinosaurs, but why?" Witmer added.